Henry H. Liles enlisted September 22, 1862 at Waynesville. He was enlisted by Capt. T.S. Hopkins. As most of the soldiers who were at Elmira, Henry became sick from the conditions. He died September 30, 1864 of chronic diarrhoea. 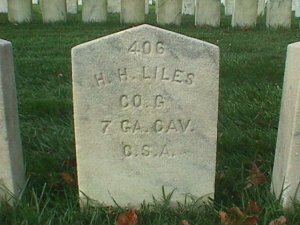 Private Henry H. Liles was buried in grave #406 at Elmira. Information provided by John Liles, gg grandson of Henry H. Liles.